OK. So I had some worry about this package arriving. I ordered it on Cyber Monday, and it showed up on Dec. 23…. (This was supposed to be a holiday special item). As I worried, the tracking information indicated only that it was in Georgia. I was going to call and complain, when lo and behold, the information updated to Greenville SC, and it was magically at my post office before the end of the day. The item was in the box…It was boxed in another mailer box, as expected. I was halfway expecting one of the brown boxes that people have been getting. Boxes that are supposedly more environmentally friendly or something. But this is the exact same kind that all of my other figures have shipped in! The first thing I noticed when I opened the mailer was WOW I CAN SEE THE DETAILS ON THAT SKY JET SLED ALREADY! To clarify something, in case I slip. 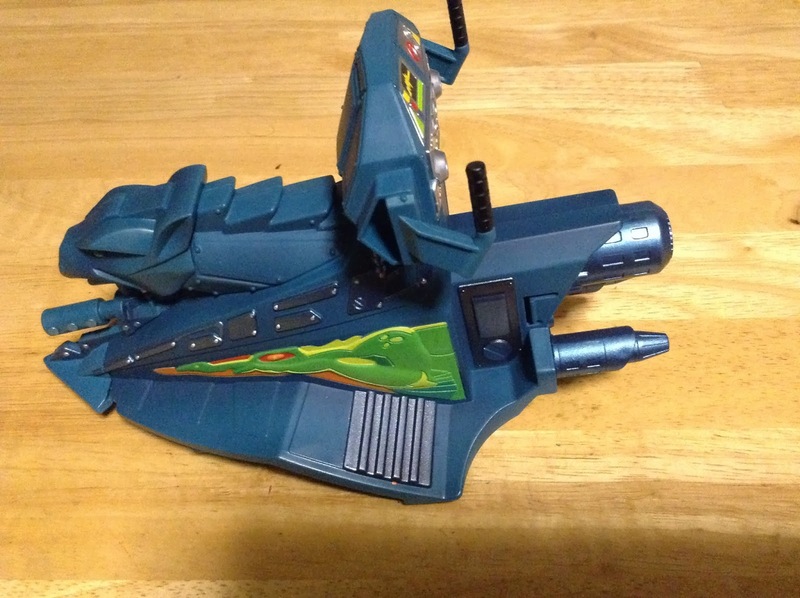 I always called this vehicle “The Sky Sled.” And over the years I have named a few USB flash drives “Sky Sled.” Sometimes including a picture of the vehicle from the cartoon as the icon! I realize that the terms may be interchangeable. To me it is the Sky Sled. To you it might be Jet Sled. Tomato. To-mah-toe. And you flip the box over for these not so boring details. You see, Sky High isn’t a vintage figure. So he has no back story except what they included here. Sky High was one of the model kit pilots from the rarely seen model kit box art. Wow that’s obscure! He really belongs alongside the Fighting Foe Men, who I am a fan of, but do not own. I think the bio-story here is separated from the FFM because the FFM were meant to pay homage to the Four Horsemen’s staff, and Sky High here not so much. I suppose I will go ahead and review him. 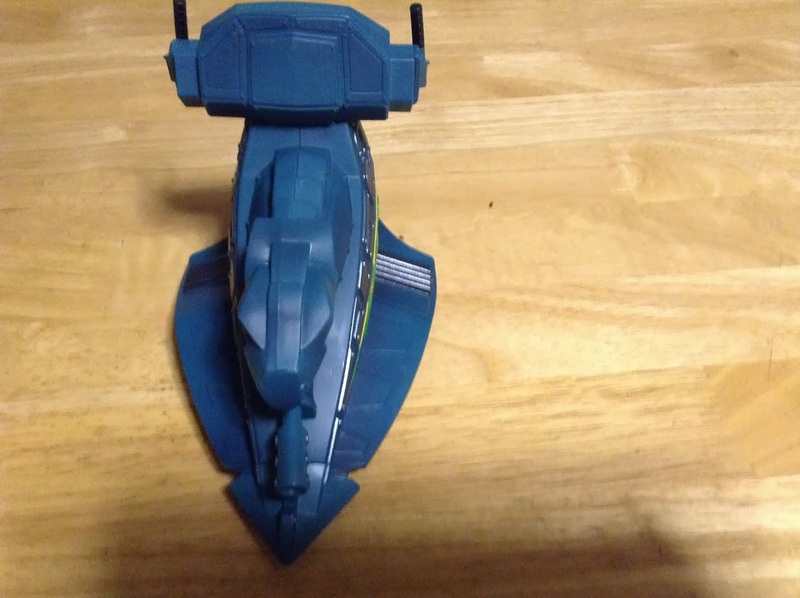 This is a cool new figure, that seems to largely reuse parts. I don’t own Trap Jaw, but it seems his lower body is just Trap Jaw’s stuff. That is new armor, and a new helmet, but I think those gloves may be Sir Lazer Lot’s. Since the SLL at my house was stolen…. He comes with a weapon that represents the Wind Raider. It fits in his hand in the middle, making a “fan sword” like Hotaru used in Mortal Kombat Deception. 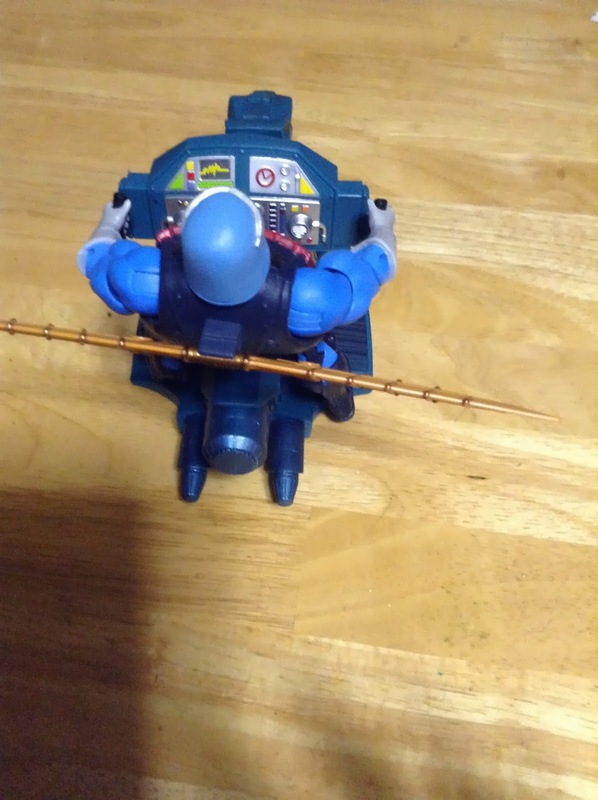 Or you can clip it to his back to make a jetpack. I personally think the paint job is excellent. I don’t see any slop. I like his color scheme as well. Sky High here feels generic. Kind of like Vikor, Blonde Teela, Draego Man, or the Griffin. He could be any pilot, really, and that is what is cool about him. You see, you could just forget there is someone named “Darid,” whose nickname is “Sky High.” This could simply be someone’s flight suit! Just do a head swap! 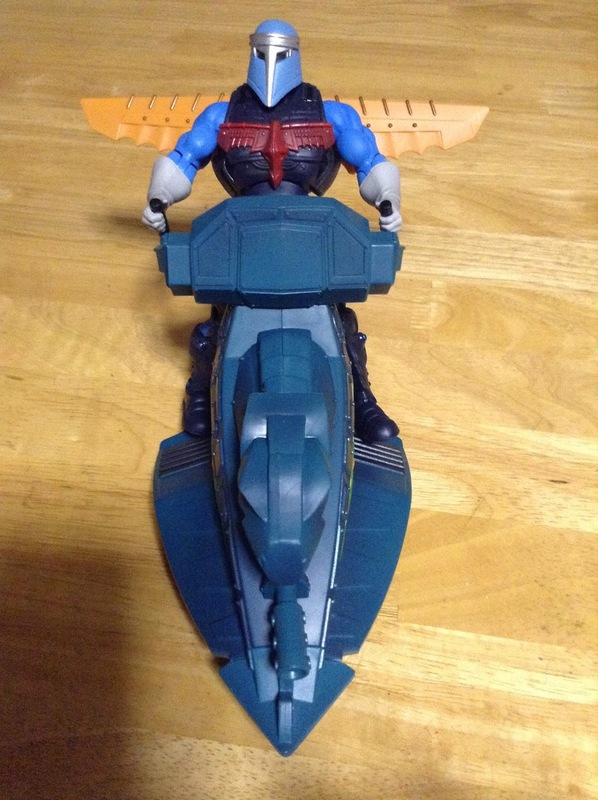 Or maybe He-Man was feeling safety conscious, so he wore a helmet on his romp towards Snake Mountain in the Jet Sled. How nerdy is the SpartanNerd? 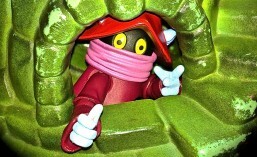 Sky High’s mask reminds me of Maximillian from “The Black Hole.” I think it is the facelessness of him. And those eyes. He also resembles Boba Fett somewhat. Now for the good stuff! THE SKY JET SLED! It is amazing! Should I get a Wind Raider!? I am super impressed with the SKY SLED! Those sculpted details that I first saw when opening the box are all over it! There isn’t one lazy decal anywhere! Just sculpted, painted, fine details. 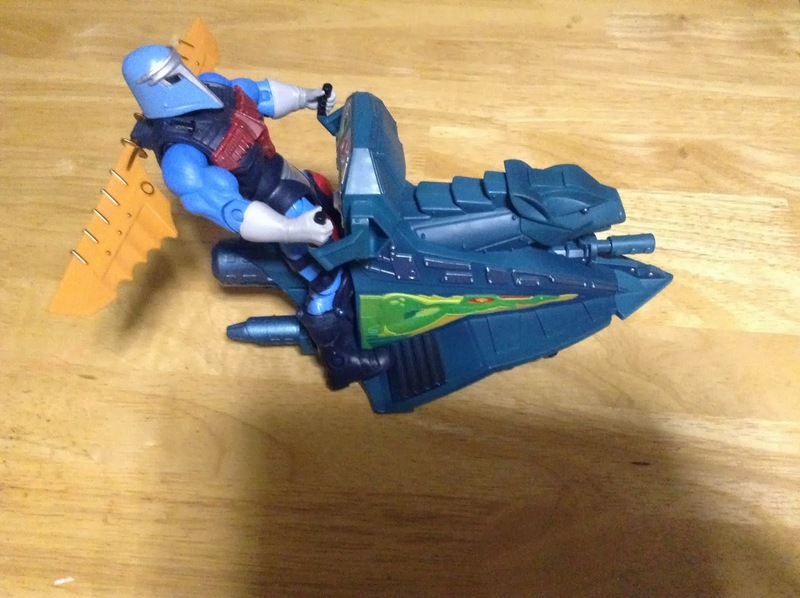 I love the Sky Sled so much because it was a Good Buys/ Bad Guys vehicle. Though you never seemed to see the baddies driving one connected to the Battle Ram. Somehow, I also seem to think that the bad guy version looked just a tad more evil, like maybe had a more definite dragon head rather than the cat/bird looking thing the good guys had. * Hey. Maybe I’m wrong, but I did remember Maximillian! Pictures are worth 1000 words. So here goes! I have virtually never seen a vintage Sky Sled who still had the stickers intact. That will never be a problem with this model! Both sides are the same. Here I would like to say, clearly this was designed for a future Battle Ram to dock with. The underside of the Jet Sled also has a ton of detail, and…What’s with that hole? 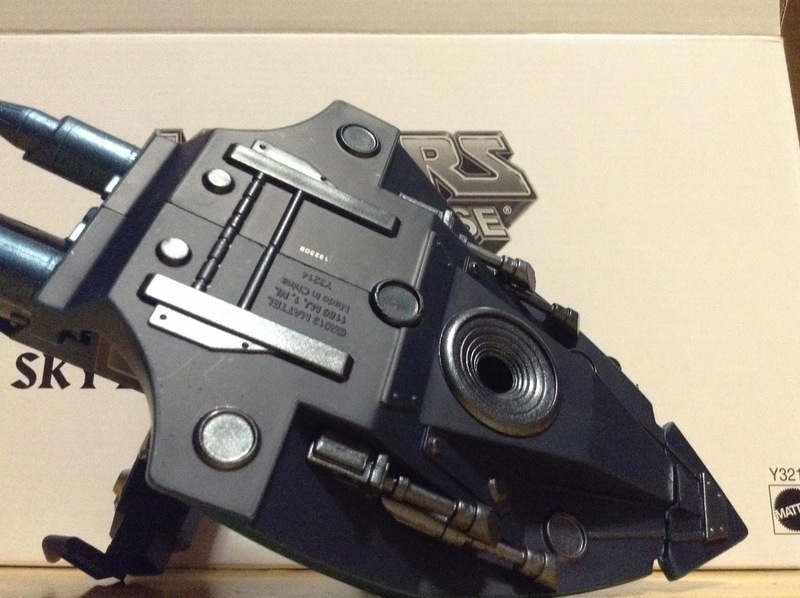 It is a hole for the Wind Raider flight stand. (Not included here. So maybe I SHOULD get a Wind Raider too?) You can also see where the horsemen have added some additional guns! 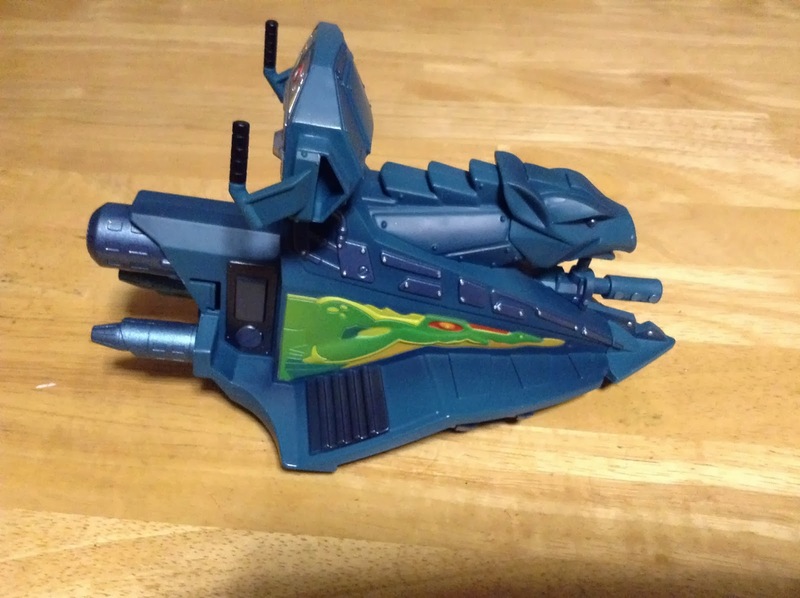 What does Sky High look like on this vehicle? Pretty cool. But why fly a Sky Sled if you have a jet pack? The black handles are nice. But in a way they don’t feel as rustic as the vintage method of the figures hanging on. You can see that my vintage Battle Ram and Jet Sled have really done some serious ramming over the years. I am including some comparison pictures. The Jet Sled here along with pilot is as large as the vintage version COMBINED WITH THE BATTLE RAM! 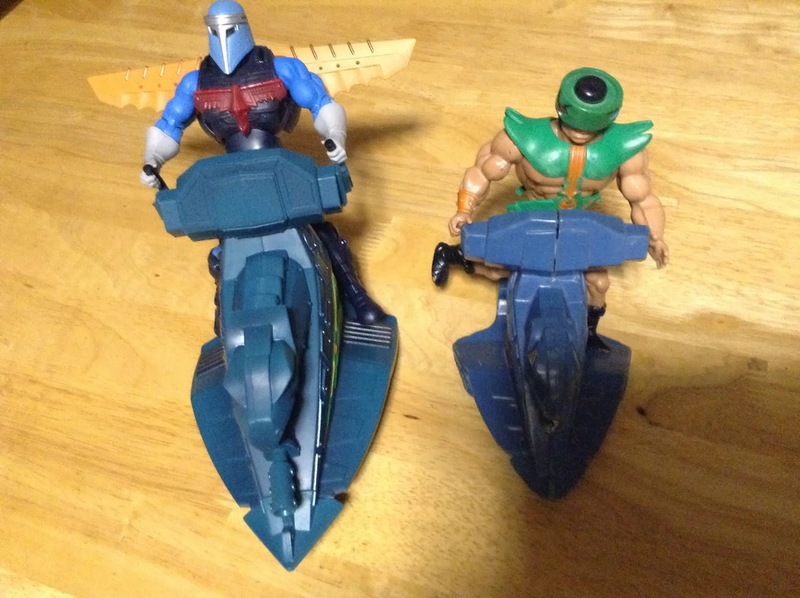 That just shows that the real scale differences in the MOTUC figures and the vintage figures. The Jet Sled feels just as hollow as the original, and I am sure it is. The original has a pretty definite seam running up the line of symmetry…The same thing seems to be the case here, so I wouldn’t REALLY send it in the air, as I am certain it would break in half. This explains the “lightness” of the packaging I am sure, as it is hollow plastic. That said, the seam isn’t pronounced, and really just adds to the vintage feel of the thing! How do you sell Jet Sleds? But the Jet Sled gets 5/5…A solid, Solid, SOLID 100%. It feels vintage. Plays vintage. But is totally updated in scale and quality. Now, I can’t wait until they release a Battle Ram to go with it! *James Eatock uses the term “War Sled” when referring to the one Skeletor is riding on the “He-man and She-Ra Christmas Special” commentary, which is on You Tube. I have never heard this term, but like it as a contrast in that it sounds more evil. (I will never argue with Busta Toons, and you shouldn’t either!) Oddly, Skeletor is flying a version that has extra room on the seat, as if he intended to carry two earth children when it was designed! 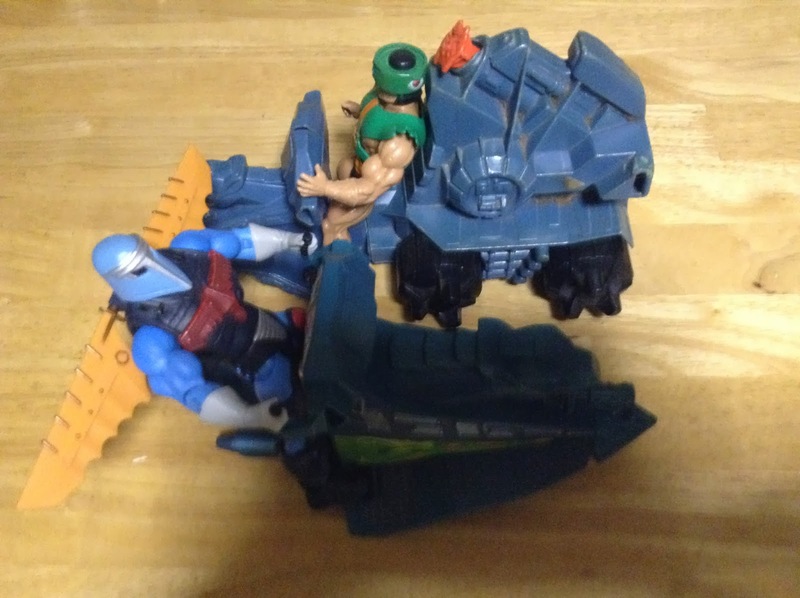 This entry was posted in Albums, He-Man, Masters of the Universe Classics, Sir Lazer Lot, Sky High with Jet Sled, Teela, toy review, Trap-Jaw, Tri-Clops, unboxing. Bookmark the permalink.